I never made this salad once I was married and had kids because neither of my kids liked peas, I know, crazy kids! But just recently my son Seth has decided they aren’t so bad. 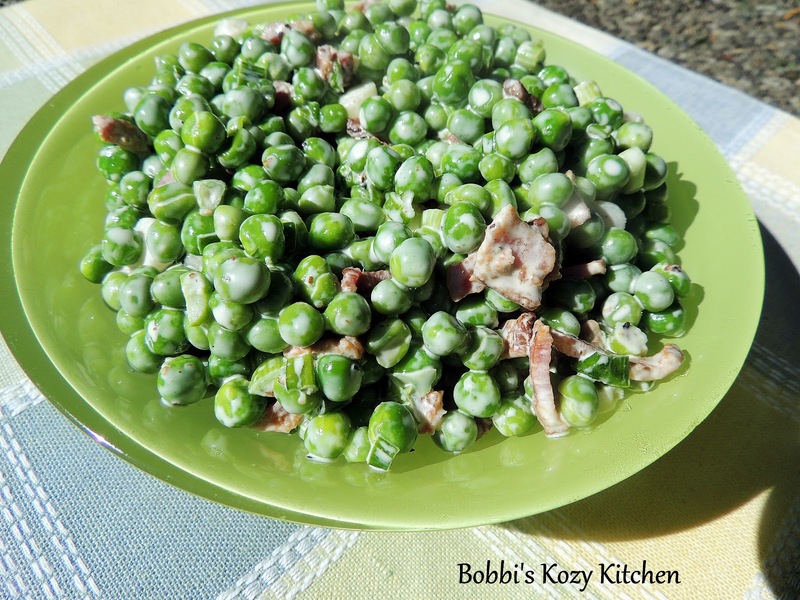 The rest of us here love them so as soon as the weather warmed up I knew exactly what I wanted to make…..Mom’s Pea Salad! This is such a simple recipe you will love it! I didn’t change it up a bit (of course) but it is still her basic recipe. It was really a great feeling to be in the kitchen making something that reminded me of my Mother. She has been gone now for 7 years, and you know as the years go on you miss them but everyday life takes over and you think about them less and less. As soon as I decided to make this recipe so many thoughts of my Mother flooded my head. It was like she was with me all day. It really was a wonderful feeling. I even caught myself saying to her “Mom I hope you don’t mind I changed your recipe, but you know me” I know she would have laughed and shook her head. As I said this is a simple recipe with a lot of love. I hope maybe it can become one of your family’s summer favorites! You may want to make a double batch though because a single batch went so fast people were actually licking the bowl! !